Since February 2012 I’m an avid user of Pinterest and owner of 41 boards, 1137 pins and 123 likes. But why? To explain myself, a few examples. 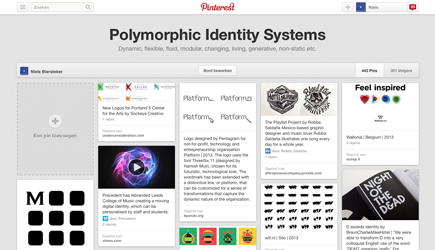 The images above show the latest pins of my Pinterest board ‘Polymorphic Identity Systems’. This is the place were I collect examples of ‘flexible’ logo’s and visual identities (total of 280 pins, 81 followers). Update (2013.09.13): 443 pins, 301 followers. 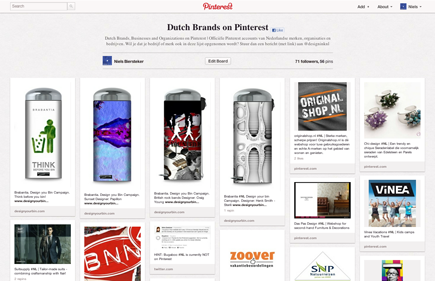 The ‘first’ creative marketing campaign on Pinterest (Peugeot campaign) inspired me to research Dutch brands on Pinterest. Research in March-April showed limited activity of (high profile) Dutch brands. The overview of Dutch accounts on Pinterest (Pingids) noted mainly individual users (Nr 1: Ank, 113450 followers) and magazines (Nr.3: 101Woonideeen, Sanoma Media, 3532 followers). 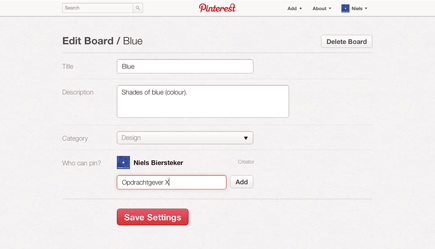 By now i have found approximately 50 dutch companies with an official Pinterest-profile. #Collectievissen. Cultural institutions and libraries pin and share their collection by using this hashtag. Design your Bin entries. Design-contest by Brabantia. Following other users and/or boards results in an imaginative visual feed, which inspires and activates to ‘repin’. It is also a possibility to follow general topics (Art & Design) or to find an affordable gift by browsing the $20-50 range. Furthermore, it is dead simple to share a board with a collegue or client, for example by creating a moodboard for a specific project you’re working on. For more information on Pinterest and creative possibilities, have a look here.